Bess, George, and I didn’t know what to say. We wished we could console Stacey as she watched clumps of oil wash up on her private beach, but we felt just as badly as she did. It was “the morning after.” Just yesterday afternoon, a luxurious yacht had exploded off the coast, sending gallons of oil spilling onto the shores of Malibu’s rich and trendy Malachite Beach. Stacey, a celebrity event planner, had just returned from Las Vegas to check out the damage. The blackened sands and oil-slicked dune grass wasn’t much of a welcome, to say the least. “No matter how I try, I can’t understand it,” Stacey said. “How can one burning yacht create such a major spill?” She held her nose to block out the acrid smell in the air. “You mean the cult cruise,” Bess said with a frown. “Cult cruise” was right. I still couldn’t believe Bess and I had gone undercover to investigate a brainwashing cult being run right next door to Stacey’s beach house. Our vacation in Malachite had started out so perfectly. Stacey had invited the three of us—me and my best friends Bess Marvin and George Fayne—to spend a few weeks at her house while she worked an event in Las Vegas. Stacey had once worked with George’s mom, but Mrs. Fayne had lost touch with her over the years, until Stacey called out of the blue with her awesome invite to California. At first we thought the beachfront mansion at the secluded end of the beach was some kind of trendy spa, but we soon found out the truth: Roland’s Renewal Retreat and Spa was a front for a brainwashing, money-stealing cult. Stacey pulled out her smartphone to check for texts. I watched as black oil washed up on the beach. After Bess, George, and I had blown the whistle on Roland, he refused to be taken alive. Before the police could come arrest him, he blew up his yacht—and himself. It was Roland’s way of going out in a blaze of glory. He got the blaze part—although I saw no glory in destroying a beach and its wildlife. I was surprised Stacey knew so much about the tall blond woman with the frosty voice—especially after admitting that she hardly knew her neighbors. But this was Hollywood, the land of celebrity gossip, where everyone knew everyone else’s business. “That creepy Eddy Fluegel with the worms crawling out of his ears gave me serious goose bumps,” Bess said, pretending to shiver. I smiled at my two best friends. It was hard for anyone—even me sometimes—to believe they were cousins. George, with her dark hair and eyes, was a computer geek, and when it came to her clothes, comfort was essential. Bess’s closet was stuffed with clothes that never got dirty—even when she repaired cars or whatever else needed fixing. Unfortunately, Bess couldn’t fix Malachite Beach, and I wondered if anyone could. The coast guard was still working at extinguishing the last of the yacht’s burning debris. “You mean his corpse?” I asked. “Did you say Marty Malone?” Stacey asked. Bess, George, and I traded confused looks. Return flights? “We’re not going back to River Heights,” George told Stacey. Stacey looked up. “You’re not?” she asked. I shook my head, though I had to admit River Heights was looking pretty good right now—especially after what we’d been through. I missed my boyfriend, Ned, and my dad with his lawyerly advice. And I totally craved our housekeeper Hannah Gruen’s comfort food and hugs, but my friends and I still had work to do—and this time it wasn’t detective work. “We’ve decided to stick around and help clean up the beach, Stacey,” I said. “Clean up the beach?” Stacey repeated slowly. “We still have more than two weeks to go on our vacation. We might as well do something useful,” George said. Stacey frowned at the interruption. I did too when I saw who it was—the famous Casabian sisters walking over from their own private beach. Not that I wasn’t happy to see the über-glam Mandy and Mallory. We had become friends with the sisters when we tried to rescue their younger sister, Mia, from Roland’s cult. What I wasn’t happy to see was the producer and camera crew from their reality show, Chillin’ with the Casabians. Hurrying to catch up with them was Mia. She had been totally brainwashed in Roland’s cult, but the glazed zombie look in her eyes seemed to be gone. Stacey seemed to grit her teeth as Mandy and Mallory wrapped their arms around her. Bev stared at Mandy as she pointed to the camera. “What is it?” Stacey sighed. “Will it be on your reality show?” I said, hoping not. Bess squeezed my arm in excitement. A meeting of Malachite residents meant celebrities! The three of us were totally amped, but when I looked over at Stacey, her mouth hung open in astonishment. “A meeting to save the beach?” she asked incredulously. I couldn’t understand why Stacey wasn’t more supportive or even excited about the party. Didn’t she want to save her own beach and property? Without saying good-bye, she walked toward her house. She didn’t realize that Bev and the camera crew were trailing her halfway up the beach. “Somebody didn’t have her coffee this morning,” Mandy said when Stacey left. “Never! It’ll probably be a little nip here, a tuck there. You know—that kind of stuff,” Mallory answered. I rolled my eyes. Mallory was fine just the way she was—but this was Hollywood, where fine never seemed to be good enough. “And vice versa,” Mallory added. “Good riddance,” George said under her breath. I was happy the crew was leaving. They were like an annoying mosquito you couldn’t swat. 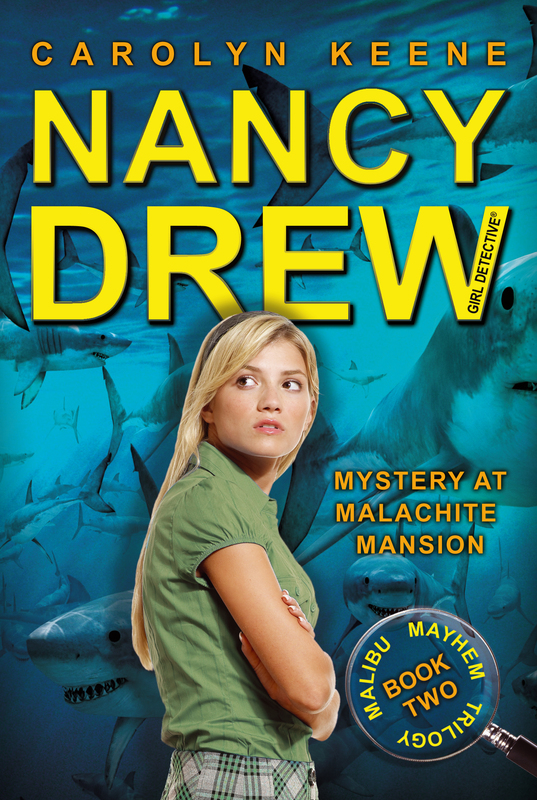 Mandy and Mallory followed Bev and the crew back to their own beach house. Mia lagged behind to stare at the oily crud scattered on the beach. She had been so quiet all this time that I’d almost forgotten she was there. “How do you feel, Mia?” I asked. Mia had been severely dehydrated after Roland’s sweat lodge, just like Bess and I had been. I cringed as George repeated the words Roland’s followers had chanted as they prepared to dump garbage from his yacht into the ocean. According to Roland, the trash-dump exercise reflected the release of negative thoughts. Not only had Roland messed with people’s minds, he’d also messed up the ocean. In fact, our whole investigation had started when George accidentally stepped on a washed-up hypodermic needle. As Mia made her way to Villa Fabuloso, I heard a familiar chop-chop-chop noise. I looked up and saw several helicopters hovering overhead. “Probably news crews,” I decided. “More dead fish?” I asked. “More dead something,” George replied. She wasn’t kidding: Washing up onto the beach was … a coffin!